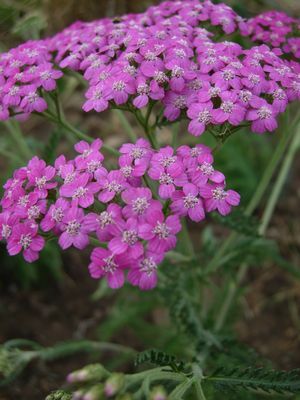 Achillea millefolium ‘Island Pink’ has dark green, fern-like foliage topped with clusters of bright pink flowers that last for weeks. Stems are roughly 18 inches. Blooms may vary in color from near white to pink. Named for Achilles, yes, the Greek Trojan war hero, the plant was named for its healing properties as a balm for battle wounds. Other names include woundwart, bloodwort, milfoil and nosebleed. 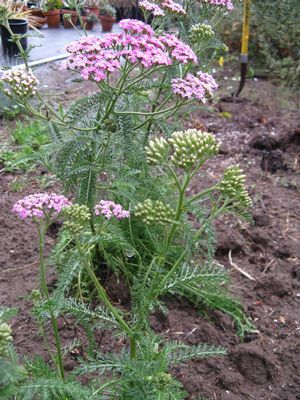 For best results, plant Island Pink Yarrow in sun to partial shade with occasional to moderate watering. Plants do not seed as the flowers are sterile. Propogate by dividing the root ball.